What to eat in Hanoi Vietnam? That is the first question to ask yourself upon arrival. Vietnam is known for amazing cuisine and the food in Hanoi in Northern Vietnam is particularly noteworthy. We had a fantastic time sampling Hanoi bun cha and other Hanoi food specialties. Read on to find out about the things you need to nosh in Hanoi including both classic dishes and modern fare. Start your day with an egg coffee at Cafe Giang. Back in the 1950s, milk was scarce during the fight for Vietnamese independence from French colonial rule. Cafe Giang invented a variation made with frothed egg rather than milk. This delicious combination which tastes more like dessert than a coffee (but still packs a caffeinated punch) is a great way to spend a morning. If you like tiramisu, you'll love Vietnamese egg coffee. Coffee in general is all the rage in Vietnam. We visited The Note Cafe near Hoàn Kiếm Lake in the Old Quarter of Hanoi. I sampled a sweet coconut latte to go which I enjoyed on our Sunday walk around the lake. While I was waiting for our order, I left a note of my own for future patrons. It was gimmicky but fun. Hanoi is especially known for Bun Cha, a dish comprised of hot meat patties kind of like hamburgers accompanied by cold thin noodles and an ample serving of greens along with a flavorful sauce on the side. We tried Bun Cha at New Day Restaurant in Hanoi's Old Quarter but there are plenty of places to try Bun Cha all throughout the city including street food stalls that specialize in this one dish. You can't miss it. Speaking of stalls that only feature one thing, pho is a must try in Hanoi. The composition of pho varies from north to south in Vietnam. Hanoi pho features thicker noodles. We stopped at Pho 10 near our hotel which was packed with a line out the door. We ordered well-done beef pho and slurped to our hearts content. After traveling in Cambodia and Vietnam for nearly two weeks, we were ready for a break from noodles and rice. We spotted an interesting pizza place on Google Maps called 4P. The place was hopping on a Tuesday evening and we had to sit at the community table. We didn't completely fall off the wagon and order western food. The pizza was infused with Vietnamese flavors. We ordered a pizza comprised of half homemade cheese and half ginger pork for an Asian fusion flare. 4P even gave us complimentary mojito jello on a spoon to cleanse our palate because we had to sit at the community table (not a big deal as far as I was concerned. They seated us right away and we were able to fill our bellies.). I'll take the gift though! We read good things about Polite Pub in Hanoi on Google Maps and decided to drop in for a cocktail. We dropped in during happy hour and were pleased to find that cocktails were discounted. Charlie Chaplin silent movies played on a screen in the dark bar. We sampled a craft beer (Pasteur St. IPA) and then switched to some great tiki cocktails. I absolutely loved the mug our cocktail was served in. Polite Bar was also great for people watching. One of the bartenders was being trained and it was fun to watch the expert show the newbie how to properly shake a drink. There was also a waitress working there wearing a skin tight and very skimpy Budweiser dress which caused me to raise an eyebrow. I suppose that's effective marketing though, just not to us. The only downside to Polite Pub is that smoking is allowed inside so you will smell like an ashtray after visiting. For us, it was worth it given the quality of the cocktails. Such a fun evening! On our final morning in Hanoi, we definitely needed a quiet pick-me-up. We ducked in off the busy streets down a quiet alley and into hipster Tranquil Books and Coffee. Once again, I ordered a coconut coffee that I sipped surrounded by books. Tranquil Cafe even features a side entrance leading to a small balcony (you must take your shoes off before entering). We kept our shoes on and sat in the main part of the cafe. Hanoi is also famous for Banh Mi (Vietnamese sandwiches). We sought out Banh Mi 25, the most famous outlet in Hanoi. We ordered one barbecue pork banh mi and one made with ham. It's common to order the sandwiches with pate but in our case we opted out and just went for the meat sans pate on a crusty French roll. Such a great lunch to end our visit to Hanoi before heading to the airport. Have you visited Hanoi? What are your favorite foods of Northern Vietnam? 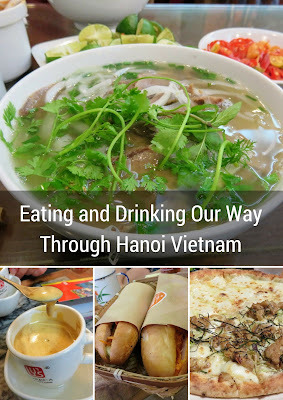 Learn about what to eat in Hanoi Vietnam. Explore the best food in Hanoi old quarter. Seek out Hanoi bun cha and other Hanoi food specialties.